Подробнее обещают рассказать до 28-го января (по нашей информации, произойдёт это в Вейк-ан-Зее). "Новый формат создаётся с целью повысить интерес со стороны зрителей и игроков", - говорится в сообщении. Напомним, серия Гран-При 2017 состояла из турниров по швейцарской системе, а до этого проводили круговики. Ни в том, ни в другом случае соревнования не вызывали особого интереса; в них не играли сильнейшие, а большинство участников теряли шансы на заветные путёвки задолго до окончания серии и просто доигрывали. Остаётся неизвестной судьба десятилетнего (с продлением ещё на десять лет) контракта между ФИДЕ и World Chess, подписанного в 2012-м году. По этому соглашению, компания World Chess обладает эксклюзивными правами на организацию турниров чемпионского цикла, включая серию Гран-При. Редактор нашей группы ВКонтакте Сергей Тернопольский суммирует, что известно сегодня о претендентском цикле 2019-2020. Опубликовано Mark Watkins в 21 Январь, 2019 - 17:08. I gave serious thought to KOs awhile back, including in a GP-like points system, and concluded that having single-elimination KOs was rather a poor choice (for a number of reasons). Better in this genre seemed to be to have some sort of "double elimination" (call it repechage?) for each event. For instance, with 16 players, have 4 rounds, but keep the guys with single losses around, at the end having one winner (undefeated) and four "second place finishers" (with one loss each). Particularly, the distribution of GP points made more sense with this sort of system (allocating points by 1-1-2-4-8 has more variance than 1-4-3-4-4). One fan-unfriendly part about KOs is that, to put it bluntly, having only one game occurring at a time (as in the finals) is often anti-climatic and boring, and the commentators struggle to keep the show going. 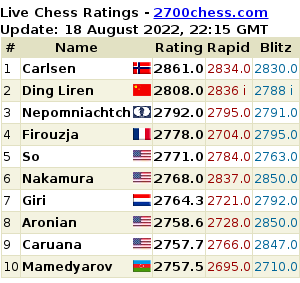 With the World Championship this works OK because of the underlying gravitas, while the World Cup final seems to have a love-it-or-hate-it sort of response (especially as both players are already qualified for the candidates). Indeed, this was one reason why I focussed on having the "double elimination" angle: there would still be four matches going even in the final round, one to determine the Winner, and three for the other guys trying to salvage the event with a "second place". Moreover, if you've spent the travel funds to get the players there, sending half of them home after 2 or 3 days leads to a tendentious cost analysis. The double elimination system (with 16 players) would have 12 of them still there at the halfway point, and as noted above, half (8) of them still fighting for something in the final round. With the Chess World Cup, the players are expected to cover their travel costs (as is indeed typical in other sports like tennis or snooker), so the calculus is perhaps different. The prize fund of 130000 euros per event is again on the low side IMO. As the article notes, there is still the flaw that by the time the fourth event rolls around, most of the competitors will just be showing up to play out the string - perhaps they could still win that event, but the incentive for the Candidates spots will not be there. There are ways to try to overcome this, but just having a working system is probably more important now than fine-tuning it. The lack of bidding for host cities indicates that much talking behind the scenes must already be talking place, but it also suggests that the venues will be the typical FIDE locales, rather than anything more high-profile. Опубликовано echo2011 в 22 Январь, 2019 - 11:14. Повысьте плату нам за ЖКХ. Я лично никого не попросил. И почему организаторам всегда кажется,будто их новшества будут вызывать интерес? Опубликовано часопис в 22 Январь, 2019 - 15:10.
этим уже никого не удивишь! машет рукой, ногой или спинкой? вот этим уж точно "изумишь"! 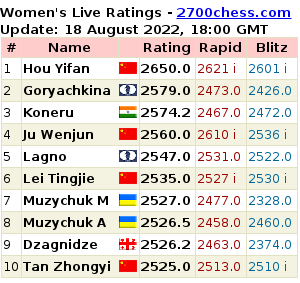 Опубликовано 18Pawn18 в 22 Январь, 2019 - 14:08. Как говорится-время покажет. Если составы будут интересными и получится борьба ,то можно будет и понаблюдать за игрой. На президентском совете ФИДЕ в Чэнду одобрены контроли времени для турниров под эгидой Международной федерации. Начиная с ближайшего цикла, не будет ни одного контроля, в котором не добавлялись бы 30 секунд за каждый сделанный ход, начиная с первого.